Built along mountains, the Huangyaguan section of the Great Wall is a good choice for visitors to take some exercise and appreciate the fine views of its steepness and splendor. It is also ideal for getting some peace and quiet, as there are few visitors. It&apos;s famous for the Huangyaguan Marathon. It was listed as World Cultural Heritage by UNESCO in 1987. 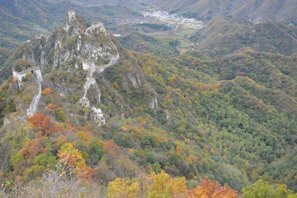 Address: Huangyaguan Village, Xiaying Town, Ji County, Tianjin; 120 kilometers east of Beijing and 150 kilometers north of Tianjin, about 3 hours’ drive from Beijing. Features: The Great Wall Marathon is held on Huangyaguan&apos;s Great Wall each May. 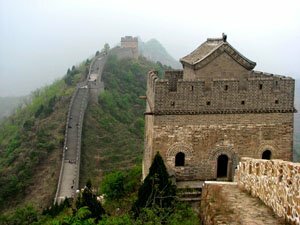 North of Jixian Town, Tianjin, the 42-kilometer (26-mile) Huangyaguan section of the Great Wall is 120 kilometers (75 miles) from downtown Beijing and 150 kilometers (93 miles) from downtown Tianjin. This section includes Malan Pass in Zunhua County, Hebei Province, in the east, and Jiangjun Pass, Pinggu, Beijing, in the west. 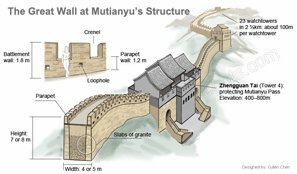 Built in the seventh year of the Tianbao Period (556) during the North Qi Dynasty and rebuilt by famous General Qi Jiguang in 1569, the Ming Dynasty, the Huangyaguan section of the Great Wall was greatly damaged in numerous horrible battles. 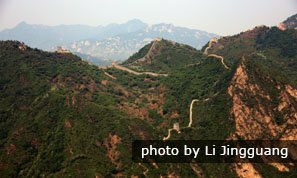 Under the great call of “Love China and Build the Great Wall” proposed by Deng Xiaoping in 1984, the Tianjinese renovated the Huangyaguan section of the Great Wall and Taipingzhai Village, including 3 km (1.8 miles) of the wall, 20 watchtowers, one pass fort, and one gatehouse. 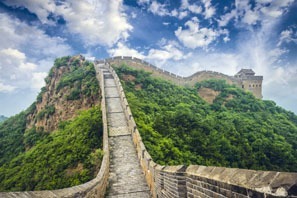 It is the longest of the Great Wall renovation projects. Dimensions: The fort wall is 890 meters long and it encloses an area of 38,000 square meters. Architectural Features: Brick or stone wall, square or rectanglular watchtowers, hollow or solid bricks, and an eight-trigram street layout can be found in the Great Wall tourist area. The pass streets are named the Eight-Trigram Streets or Eight-Trigram Maze. There are zigzag lanes with many T-junctions, therefore it is hard to find a way out, and it is fun to experience it yourself. The Huangyaguan Great Wall Marathon is held every year in April/May. Take a bus at Beijing Sihui Long Distance Bus Station or Tianjin Hebei Bus Station to Jixian. 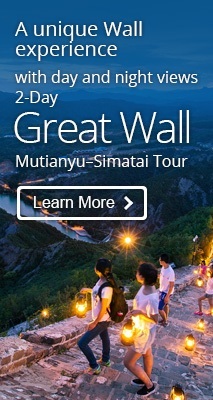 Then transfer to a minibus to the tourist area for about 10–25 RMB/person. If you are interested in visiting Huangyaguan, we can tailor-made your a private tour. 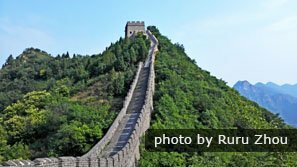 We will transfer you in a comfortable air-conditioned car and you will explore this less-crowded section of the Great Wall with our professional English-speaking guide. Many farm houses at the foot of the Huangyaguan section of the Great Wall provide accommodation and simple Chinese dishes for visitors. They are not expensive due to having simple facilities. Visitors usually go in the morning and return in the afternoon. You are not recommended to stay the night. Dress for hiking and dress for the weather. Choose comfortable footwear with a good grip and support for the feet. Layers of clothes that can be taken on and off allow for greater comfort and temperature control. Wear/take sun protection in the summer and dress for sub-zero temperatures in the winter. What to Take: Take breathable waterproofs for protection from the rain and wind. Umbrellas may be used there as the ascents and descents are not difficult, but may be inconvenient in strong winds. Take snacks and water if you want to walk a long portion of the wall.